The J. Clinton Mackenzie estate designed by himself c. 1900 on Centre Island. Click HERE for more on the J. Clinton Mackenzie estate. Click HERE to see the house as it looks today in Nassau County tax photos. 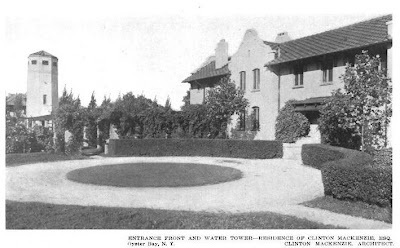 Photo from Architectural Record, 1911. It's still a lovely house. P.S. Too many pots out front! Proportion, people, proportion. Am I crazy, or was this a view of Frederick Platt's terrace just a few minutes ago? The Pratt photo was mislabeled. Will reappear soon. Home looks great and there is nice coloring imparted by the homes materials. Potted topiary does make the building look like a garden center, but that is easily changeable. LOL archibuff -- a few multi-colored triangle flag streamers & it would look like a garden center having a deep discount sale! I also like this house even with the ivy ... although I like the earlier, more mission-style version better.